Desarrollado junto con el T-126 en planta Nº 174 desde la primavera hasta el otoño de 1940. El desarrollo del vehículo se suspendió durante la fase preliminar del diseño y luego se abandonó debido a problemas con el motor diesel V-3. The T-127 have good sloped armor and fast acceleration and a good gun. 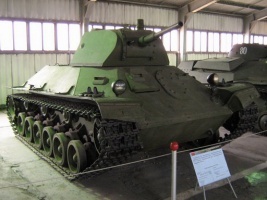 The T-127 is more a heavier tank than its brethren, the BT-7 and the T-46, and as such trades some agility and speed for increased armor and slightly improved armament. This makes the T-127 more of a frontline tank rather than a true scout. Indeed, the sloped armor will allow you to bounce a lot of shots from other tanks of the same tier, and take multiple hits without much trouble. Don't fear autocannon and machinegun equiped tanks you'll face, as they will simply bounce off your frontal hull and rarely ever penetrate, just keep your cool and shrug off their fireworks. If you use cover and time your shots, you can take on multiple opponents and last very long in close combat. For this reason, the T-127 works quite well in city maps such as Himmelsdorf. However, its moderate top speed and traverse rate make it relatively vulnerable in the open. Tank destroyers are still a threat to you, especially at longer distances, and you're not a difficult target for artillery. The best way to defeat these enemies is to flank them, or roll with a group of teammates. Esta página fue modificada por última vez el 25 oct 2016, a las 11:03.